Montana Secretary of State Linda McCulloch says this mailer is deceitful because the use of the Great Seal of Montana makes it appear to be a voter guide from the SOS office. 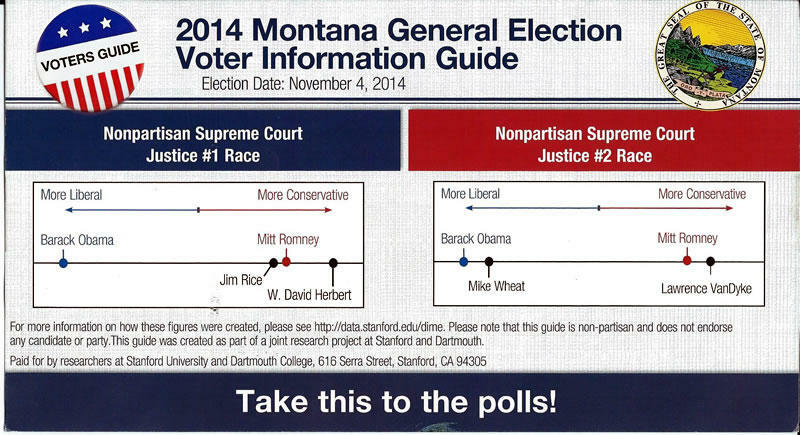 Have you received an official-looking mailer that rates the political leanings of Montana's four nonpartisan Supreme Court candidates? If so, take a close look at it; the flier features an image of Montana's state seal and compares the candidates' political ideologies to those of President Obama and former Republican Massachusetts Governor Mitt Romney. Problem is, it's a fake. The state of Montana has nothing to do with these mailers. "What most people are complaining about is the use of the great seal, on a document that is targeting a candidate race. It is not a voters guide put out by the Secretary of State and it has no blessing of any official in the state of Montana." "From my realm it's the use of the Great Seal of the State of Montana. I'm the keeper of the Great Seal and I grant permission to use the Great Seal and I have never granted permission of political flyers. We received a lot of phone calls and people are wondering and really outraged that it came from our office. It did not come from our office. I want to make sure people understand that. We wouldn't send out campaign mailers anyway." McCulloch says the legality of these fliers will have to be determined by Jonathan Motl, Montana’s Commissioner of Political Practices. Edward O'Brien spoke with Motl. Edward O'Brien speaks with Montana’s Commissioner of Political Practices Jonathan Motl about a "deceitful" campaign mailer using the Montana seal. Lawrence VanDyke, Mike Wheat, David Herbert and Jim Rice are candidates for Montana's open supreme court seats. This election year, Montana's state legislative races look to be the most intriguing. State lawmakers are, "the ones that will actually effect what happens in Montana in terms of policy, as far as who controls the legislature in 2015," says Lee newspapers Capitol Reporter Mike Dennison.